How Dallas’ Invitation Homes quietly became the biggest owner of single-family rental houses in the country. It was 2013 and Fred Tuomi had recently retired after more than 20 years at Equity Residential, a multifamily real estate investment trust. He was living a carefree life in San Diego, enjoying time with grandkids while honing his cooking skills. But a spate of boredom, coupled with a chance meeting with the leaders of a private equity firm called Colony Capital, set him on a brand-new path. The path would eventually lead him to Dallas as CEO of Invitation Homes, a real estate investment trust that has captivated Wall Street, but remains somewhat under the radar in North Texas. Invitation’s February 2017 IPO was the second-largest REIT public offering in U.S. history, raising a whopping $1.77 billion. Then, last fall, the company became the biggest U.S. institutional owner of single-family rental homes after merging with Scottsdale, Arizona-based Starwood Waypoint Homes. Today, the combined company is poised to put its imprint on the single-family rental market, much like apartment REITs altered the multifamily landscape some 25 years ago. Colony was amassing homes at a rapid rate, hundreds at a time, but needed someone to efficiently operate its new single-family rental business. The firm’s acquisition of foreclosed homes was reminiscent of Equity Residential’s own growth en route to becoming the nation’s largest apartment REIT. In the early 1990s, Equity had snapped up large portfolios of distressed apartment properties in the wake of the nation’s savings and loan debacle. Invitation Homes has housing offerings in 17 markets including Atlanta (left), and Charlotte, North Carolina (right). 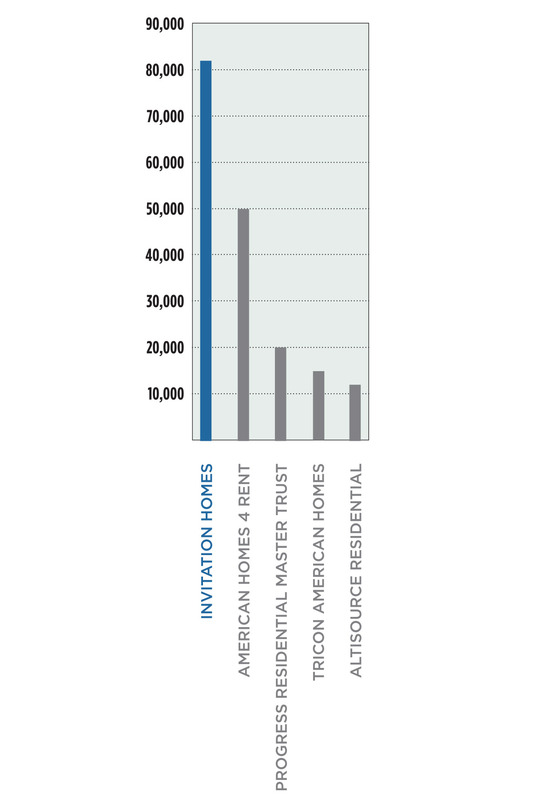 Number of homes currently owned in Dallas-Fort Worth by Invitation Homes. So, after just six months of retirement, Tuomi was back on the job, joining Colony’s single-family rental arm, Colony American Homes, as chief operating officer. (He later became co-president.) When Colony later merged with Starwood Waypoint Residential Trust, Tuomi became CEO of the merged entity. Then, in November, he became CEO of Invitation Homes. I met with Tuomi and other company executives at Invitation Homes’ downtown headquarters in the iconic Comerica Bank Tower two months after the merger with Starwood Waypoint. Following a walk down a nondescript hallway on the building’s 20th floor, glass doors lead visitors into a modern, split-level, 37,000-square-foot office with a mezzanine level looking over an expansive open space with tables, bench seating, a big-screen TV, an open-air kitchen, and a massive custom wall mural. Design elements include hardwoods reminiscent of what you’d find in a luxury home, as well as the company’s corporate color—a fresh green that evokes thoughts of a manicured lawn. When it established its headquarters here several years ago, Invitation Homes owned no properties in Dallas-Fort Worth. But, with the merger, it now owns about 2,000 homes in the region. It decided to stay in Dallas post-merger for a number of reasons, including the city’s central location, airport, reputation as a hub for large real estate companies, and access to a quality labor force. Tuomi, who lives in Scottsdale, is house-hunting and expects to move to Dallas soon. Chief Operating Officer Charles Young will relocate from Chicago. Other executives are already here. Ultimately, the entire C-suite—except for the chief technology officer, who’s based in Scottsdale—will office in Comerica Tower, where 150 Invitation Home employees already work. In some ways, the multibillion-dollar, six-year-old company likely wouldn’t exist were it not for the foreclosure tsunami resulting from the Great Recession. By 2013, several years had passed since the nation’s financial crisis first surfaced in the subprime housing market in 2007. In the wake of the crisis, hundreds of thousands of foreclosed homes blighted neighborhoods and dragged down home prices nationwide. Three giant real estate investment firms—The Blackstone Group, Colony Capital, and Starwood Capital—saw an opportunity to scoop up cheap homes, renovate them, and rent them out to a growing number of families who, because of foreclosure, no longer could qualify for a mortgage, but still wanted to live in a single-family home instead of an apartment. American Homes 4 Rent, the brainchild of Public Storage founder B. Wayne Hughes, and several sizeable private investment groups were among those who took the plunge. Wall Street was skeptical, though. It wondered: How could these huge investment groups manage scattered home sites in a cost-effective manner? The Street speculated it would be a short-term deal, and the firms would soon dump their portfolios back onto the market. From the beginning, Blackstone’s Invitation Homes was the company to watch, as it had the world’s largest investment firm backing it. By the time its Invitation Homes arm went public, Blackstone had invested somewhere between $9.6 and $13 billion in it, according to published news reports. Before the advent of Invitation Homes, though, there was Dallas Tanner and other entrepreneurs like him. Tanner’s Arizona-based company, Treehouse Group, began investing in apartments, homes, and manufactured housing in 2005. Between 2010 and 2011, Treehouse bought 1,000 distressed homes in Phoenix, a city impacted by large numbers of foreclosures. In 2011, Treehouse partnered with property management firm Riverstone Residential, whose U.S. operation was in Dallas, as it looked for opportunities to scale up. By spring 2012, the Phoenix startup and the world’s largest investment firm had joined forces. Tanner became chief investment officer of the new entity, a title he still holds. Blackstone provided most of the capital, while Treehouse and Riverstone provided the know-how. The partnership bought its first home in April 2012, and a new name for the company—Invitation Homes—soon emerged. Today the investment community is highly focused on the sector and is keeping close tabs on Invitation Homes. Green Street Advisors is one of 17 analysts now covering the Dallas company, with several projecting Invitation Homes to be their top-performing REIT for 2018. Analyst John Pawlowski says he expects single-family rental REITs to outperform multifamily REITs through 2019, through operating platform refinements, cost-cutting, and minimal new supply pressures from homebuilders. At the time I met with Invitation Homes’ top executives, all but one analyst, Goldman Sachs, gave Invitation (NYSE: INVH) a buy rating. Goldman had it as a hold. Among Invitation’s 17 markets are Orlando, Florida (left), and Phoenix (right). The last six years have been a whirlwind for this new asset class. But it’s important to note that players like Invitation Homes are still small potatoes in a highly fragmented industry that consists of 16 million single-family rentals. Institutional players hold only about 300,000 to 350,000 units of the total pie, which remains dominated by regional players and mom-and-pops. Still, it was certainly noticeable when Wall Street began buying houses on the cheap, and some experts later gave these big institutional investors credit for stopping the slide in home prices, which bottomed out in 2012. Once most of the distressed housing overhang disappeared, the big institutions built scale through mergers. This wave of mergers culminated with the “merger of equals” between Starwood Waypoint and Invitation Homes, creating the largest single owner—public or private—of single-family rental housing in the U.S., with a total of 82,000 properties. 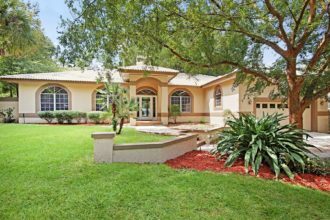 Invitation Homes now operates in 17 markets, with major concentrations in California and Florida. Freedman estimates it will take up to 18 months from the November 2017 merger to fully integrate the two companies. Starwood Waypoint, for example, had the best technology among institutional investors. Developed under Tuomi when he was at Colony American, the technology came to fruition when the “smart home” movement was just entering homeowners’ consciousness. Today, it’s driving revenue and efficiencies. Tenant satisfaction rating for Invitation Homes, on a 5-point scale. Smart locks are integrated with cellular service, for example, to allow potential tenants to self-schedule and self-show a home through a phone app, tablet, or computer. Invitation Homes knows when the potential tenant arrives, unlocks the house, and sends him or her a “Welcome Home” text. The company can remotely turn on the thermostat prior to the showing, and lower it once the potential tenant leaves. Consumers can also apply to rent the home via an online app and get a nearly immediate tentative approval or denial. Final approval comes a few days later, after a background check. “Technology is a big enabler for our business, and we don’t have to force it on our customers. They want it,” Tuomi says. Once they lease a home, tenants can subscribe to the already-integrated smart home features for about $18 more per month, and Tuomi says some markets have a 70 to 80 percent subscriber rate. Adding video costs an additional $10 to $12 a month. “It’s a great amenity, a differentiator, and a revenue source for us,” he says. The merger integration also includes a reduction of workforce in certain areas where there was duplication. Ultimately, the combined company is expected to have a workforce of more than 1,400, with many of those based in the 17 markets where Invitation Homes owns property. Charles Young, COO, says the company will also work on improving key metrics such as occupancy rate, rent growth, turnover costs, and re-lease timelines. Often compared to a multifamily REIT, Invitation Homes performs better than the multifamily market in terms of turnover, as single-family renters are more “sticky,” staying an average of three years. That’s about 50 percent longer than the typical apartment renter. However, it takes longer and costs more to re-lease a house than an apartment, Young notes. Invitation Homes spends about $3,000 on renovations after a tenant moves out and before another moves in. It spends about $22,000 upfront to renovate when it initially buys a house. Margins are roughly comparable to multifamily REITs, which is a requirement for investors to embrace this still-new asset class. Invitation Homes issued 2018 guidance for net operating income margins between 63.5 and 65.25 percent. (Specifically, that’s the range for Invitation Homes’ earnings report combined with the range from Starwood Waypoint’s earnings report.) The margin compares favorably with multifamily NOI margins, which typically range from 60 to 70 percent, depending on geographic location and rental price points. Rent growth at Invitation Homes is increasing about 4 percent a year, on par with the multifamily sector as well. Rising rents, however, are among the key complaints about these still-new big corporate landlords. A report by the Alliance of Californians for Community Empowerment Institute, Americans for Financial Reform, and Public Advocates Making Life Real focused on steep rent increases, fast evictions, and fee gouging by corporate landlords. “Wall Street Landlords turn American Dream into a Nightmare,” declares the headline on the report. The groups interviewed 100 tenants and advocate for a number of reforms, including preserving affordability via rent controls. In December 2016, the Atlanta Federal Reserve released a discussion paper, “Corporate Landlords, Institutional Investors, and Displacement: Eviction Rates in Single Family Rentals,” by authors at the Federal Reserve, Georgia State University, and the Atlanta Volunteer Lawyers Foundation. The paper focused on Atlanta, which has a high concentration of corporate-owned rental housing. The authors found that 22 percent of rental households in Fulton County (Atlanta) received an eviction notice and 15 percent got evicted, a significantly higher rate than cities with a lower concentration of corporate ownership. In some ZIP codes, more than 40 percent of rental households received an eviction notice. “Some of the largest firms file eviction notices on a third of their properties in a year and have an 18 percent higher housing instability rate,” the paper said. Hecht, the Wall Street analyst from JMP, said rental increases and rent levels that lead to eviction are market forces at work. He compared the sector to similar rent increases under way in the multifamily sector. “Someone who doesn’t own the home will be exposed to the risk of market dynamics,” he says. Mom-and-pop investors are more inclined to rent their homes below market rates in order to maintain long-term tenants and financial stability, he says. On the other hand, institutional players, because of their scale, aren’t as negatively impacted by vacancies, he adds. “The institutional single-family rental players have now bridged the gap between that mom-and-pop operating model and an institutional multifamily-type investment model,” Hecht says. Invitation Homes says it’s aware of the criticisms, and is committed to a culture and mission that’s supportive of its residents and employees. “The vast majority of our residents think we are doing a good job,” Freedman says. He notes that Invitation Homes has a 4.3 satisfaction rating from tenants on a 5-point scale. Tuomi expects Invitation Homes to continue making a major impact, and says its corporate culture will help shape that future. He says the company isn’t a big self-booster, and Dallas will eventually get to know it through its people and its reputation. Largest U.S. single-family rental companies, by total number of houses. “This is a people business,” he says. “Internally, we talk about customer loyalty. We know our task is to earn, not to demand, loyal customers.” That starts with employees who are engaged with each other and the common cause, he says.